CONGRATULATIONS TEAM RICKSHAW for raising over £2.5 million for BBC Children in Need. Beginning at the BBC’s Media Citynear Manchester, the rickshaw undertook a ‘Salford to Walford’journey across England, finishing live at the iconic EastEnders setduring the BBC Children in Need Appeal on Friday 14 November. Team Rickshaw 2014 were six young people, each supported by projects funded by BBC Children in Need, who powered the rickshaw for more than 450 miles across England. This year the rickshaw was pedalled solely by the young riders, although The One Show presenters Matt Baker and Alex Jones offered their support and advice, both from the studio and live on the road as they cycled alongside the team. In a first for 2014, in addition to pedalling the rickshaw the young riders were asked to give a speech to an audience, talking about their motivations for the challenge and their own personal journeys. A daunting challenge for anyone, it called upon the team – aged from 16 to 20 – to use all of their confidence and courage, addressing crowds at some surprise high-profile locations. The journey began on Friday 7 November in Salford, Manchester. From there Team Rickshaw headed north to Blackpool, before making their way back across the country, ending in Walford eight nights later. During this time, Team Rickshaw battled the harsh November weather as they tackled some challenging UK landmarks, including Flash in the Peak District which is the UK’s highest village. Our riders rose to the challenge when they rode their Rickshaws Around the Clock for BBC Children in Need! The Rickshaw Challenge for BBC Children in Need came back for a third successful year. It was the biggest and most challenging ever because, for the first time, riders visited all four UK nations, pedalling around the clock to cover 700 miles raising money for disadvantaged children and young people across the UK. Team Rickshaw was made up of five young people, each supported by projects funded by BBC Children in Need, who rode with partners including The One Show’s Alex Jones. Four of the riders were partnered with a parent. Rickshaw veteran Matt Baker also supported the ride, acting as a mentor and cycling alongside the riders on their eight-day relay journey across the UK. As those who have benefited from the charity’s work first hand, the young riders undertook the challenge to raise as much money as possible to help other young people across the country. The journey began on Friday 8 November in Northern Ireland. The then crossed the Irish Sea into Scotland, before pedalling down the west of England and into Wales. Finally the team headed back into England to a magnificent finish at BBC Elstree. The excitement of their arrival was captured live on the BBC Children in Need Appeal Show on Friday 15th November. For the first time, the team rode around the clock with all riders taking turns to do a nightshift. Throughout the journey they faced challenging terrain and harsh winter weather conditions. The One Show’s Rickshaw Challenge has raised almost £5 million for the charity to date. The increased distance, journey into all four nations, and around-the-clock pedalling, contributed to the team raising £1,354,459 this year! Last year nearly 7 million people watched Matt complete his gruelling Rickshaw Challenge from Edinbugh to London and this year the challenge is turned on its head as six young people will take on the challenge to help raise vital funds for disadvantaged children and young people across the UK. ‘Team Rickshaw' will be made up of six youngsters, all of whom have been either supported by or still are supported by BBC Children in Need funded projects. 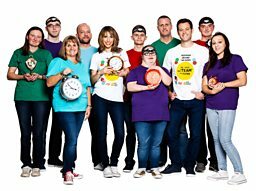 They will embark on the arduous journey on the morning of Friday 9 November from Llandudno and will attempt to complete the marathon 411 mile journey in eight days arriving at BBC's Television Centre for The One Show's Children in Need special on Friday 16 November on BBC One. Team Rickshaw will be accompanied by Matt who will cycle alongside the rickshaw offering vital mentoring advice and support after he successfully took on the Challenge in 2011 raising £1.9million for the Charity. His support will be invaluable in helping the youngsters, all of whom have faced their own challenges, complete the monumental journey. Alex Jones will also join the team rallying support along the way. Ciaran (17)is from Port Talbot in South Wales. Ciaran was born with cerebral palsy. Darren (17) is from County Durham. Darren has had glaucoma since he was born and is registered as partially sighted His mum, dad, brother and sister are all registered blind. Jack (16) is from Essex. When Jack was 4 years old hehad a kidney transplant. He is very fit now and takes part in lots of sport. James (18)is from Kent. James has been a young carer for his mother, brother and sister since he was very young. When James isn’t at college he runs the household and looks after his family. Jamila (18) is from London. Growing up, Jamila has seen young people around her turn to crime and gang culture. Despite this environment she chose not to go down this road and now inspires others to follow in her footsteps. Lauren (18)is from Stirling, Scotland. Lauren suffered a brain injury after being knocked down by a car when she was 11. She spent 6 months in hospital and was left with a broken hip, broken right leg and fractured left arm. She has remarkably re-learnt to breathe, walk, talk and eat. The One Show will go live to Dolgellauon Friday 9 November, the first stop in ‘Team Rickshaw’ Challenge. The whole programme will be on the road to greet the Team live on air every weeknight as they cross the finish line at each location. Every day viewers will be able to follow ‘Team Rickshaw’s’ progress online at the BBC Children in Need website bbc.co.uk/theoneshow and on Twitter at @BBCCiN and#TeamRickshaw, as they travel from Llandudno to London. Matt said "The Rickshaw Challenge is one of the toughest challenges I’ve ever taken on. These youngsters are going to have their work cut out for them. That’s why the public needs to get behind ‘Team Rickshaw’ and come out and cheer them on, I know from the challenge last year what a difference the public’s support can make. We need to get behind them as they strive to raise as much money as possible for BBC Children in Need." Find out more about how to donate and the terms and conditions of donating click here. 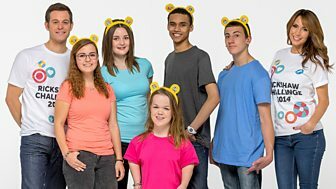 BBC Children in Need supports projects working with disadvantaged children and young people right here in the UK. They currently support around 2,600 projects that are working with children facing a range of disadvantages for example, poverty and deprivation, disabled young people and children who have been the victims of abuse or neglect. The BBC Children in Need Appeal Show is on Friday, November 16. 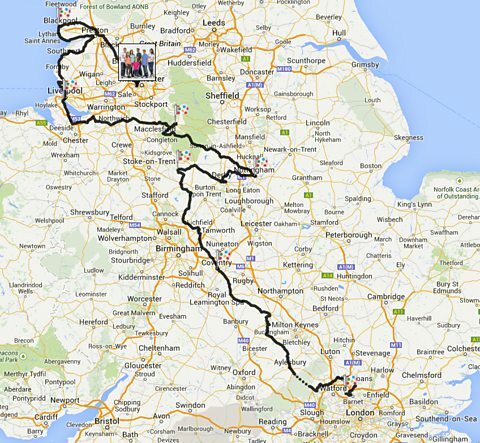 The journey begun on Friday 8 November in Northern Ireland. The then crossed the Irish Sea into Scotland, before pedalling down the west of England and into Wales. Finally the team headed back into England to a magnificent finish at BBC Elstree. The excitement of their arrival was captured live on the BBC Children in Need Appeal Show on Friday 15th November.